Review: "Dark Empire: Distant Tides" - Sea of Tranquility - The Web Destination for Progressive Music! Shades of Blind Guardian, Symphony X, and Iced Earth can be heard on the debut from Dark Empire. Based in the US and led by guitar shredder Matt Moliti, Dark Empire play an energetic form of power/progressive metal featuring plenty of histrionic vocals from Jens Carlsson, virtuoso guitar and keyboard solos, plus speedy and tight rhythms. Although their debut only contains six songs, each is over five minutes in length giving the CD a total run time of 37 minutes, short compared to many releases these days, but not lacking in superior musicality whatsoever. The opening European Power Metal sounding "We Will Never Die" sees the band, and especially singer Carlsson (who also sings for Savage Circus) pounding their chests and delivering the goods, while the more complex and neo-classical "Alchemist" finds Moliti laying down plenty of Michael Romeo inspired guitar wizardry. The symphonic "A Soul Divided" features crunchy riffs, catchy melodies, and orchestral keyboards, while the title track is a blistering concoction of prog-metal complexity and groovy thrash that also contains some effective vocal growls from Moliti. In fact, I really like the way Moliti's growls and Carlsson's soaring clean vocals play off each other on the few instances they do on this album. It reminded me a little of Mercenary, and I'd like to hear more from this in the future. The last two tracks are the rampaging metal piece "Northern Sky" and the lengthy and progressive instrumental "The Final Vision", featuring loads of keyboards and wild guitar riffs & solos. It's safe to say that there is plenty of potential contained on Distant Tides. My guess is that Dark Empire will be scooped up by a major metal label before long, and keep your eyes peeled for their next release. It should be a doozy. Dark Empire, founded by guitarist and Long Island,NY based Matt Moliti, deliver a Power/Progressive Metal Tour de Force, with their 6 song unsigned "demo", Distant Tides. At first listen a ton of influences and similarities creep into your thoughts. Annihilator, Symphony X, Blind Guardian, and even some good old '80 Metal Thrash like Testament, all find their way into what makes up Dark Empire. Neo Classical shredding meets great Swedish vocals, provided by Jens Carlsson makes Distant Tides a powerful listen. Distant Tides offers a few different textures to it. From Thrash Metal to Classical Metal that would make Yngwie smile, there is something for any metal fan to latch on to. For guitar fans, there is plenty of Neo Classical guitar shredding all over this disc. Check out the CD closer, instrumental, "The Final Vision" as a great example of Matt Moliti's chops. Other stand out tracks are "The Alchemist", a barnstormer of a track with a very Tad Morose feel to it. Powerful and fast, pulsating the whole way through, and "Northern Sky" with it's Fear Factory styled opening and pedal to the metal pace. Carlsson and Moliti make a good dynamic duo and it shows on every track. 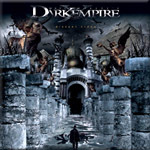 Dark Empire is completed by New Jersey drummer Sam Paulicelli, and bass player Noah Martin, and as I write this they are in the studio recording their next CD. A powerful band with a great simple idea, NY Thrash meets Swedish Power Metal! What a tasty combo. How this band has not been signed yet is a mystery. This band is very contemporary and once given the chance at a larger audience, will have a slew of new fans worldwide. Check out Dark Empire quick, before your friends turn you on to them. They are too good to go unnoticed for much longer! When I received the Dark Empire CD Distant Tides I felt the presence of Persuader/Savage Circus singer Jens Carlsson would definitely add some level of promise to the music that I would hear on this release. The vocal powerhouse being coupled with guitar virtuoso Matt Moliti finds the two leading the charge into Power Metal glory bringing to mind similarities of the existing giants Blind Guardian and Gamma Ray. The 6 song CD is loaded with stellar tracks and as you listen you will come to agree that without a doubt this band has the potential to stand alongside the notables in the genre. Opener "We Will Never Die" showcase Jens vocal prowess very well, and if you have heard his previous recordings in Persuader and Savage Circus there is no denying the dead on similarities he has to the Blind Guardian front man Hansi. The music is different from theirs of course but the almost spot on sound of the voices might cause confusion to some listeners who catch this in the middle or tail end of the track. I enjoyed "The Alchemist" as well and feel the vivid imagery used in the lyrics does the job you expect of music like this; bringing you to other worlds and times. Moliti also shines on the keyboards during "The Final Vision" which is an instrumental that touches upon the Progressive Metal genre very well. The group is rounded out by Noah Martin on bass and Teemu Tahkanen on drums and judging by their contributions to the recording you can see that no one in the group is on vacation in terms of playing ability. The CD comes with a fully detailed and lyric provided booklet with art and photos, clearly a lot of work was also laid out for the design and its detail proves ever more that these guys are aiming high from the beginning. Take a look at this release and be prepared for there seems to be a new kid on the Power Metal block � Let's make sure he is welcome.